Having pancreatic cancer put a kink in that passion. But she is still traveling. But now she's Traveling With Cancer. We have just learned to manage things a little differently. Be a little more organized. Prepare a little smarter. As always on this pancreatic cancer journey, the more you research and prepare, the better the outcome. This was the doctor that gave her a 3-6 month life expectancy. Interestingly enough, that was the best piece of advice anyone could have given mom. The Go, Enjoy, Live Life advice, not the 3-6 month part! And so they went, traveling with cancer for the first time. They cruised, they soaked up the sun, leaned on their friends and gained strength for the grueling fight ahead. 1. Traveling to another city or state for cancer treatment. 2. Traveling for business, if patient is still able to work thru treatment. 3. Traveling for pleasure, something we think everyone should do. The first two reasons are self-explanatory. The third, traveling with cancer for pleasure, is a little more ambiguous. 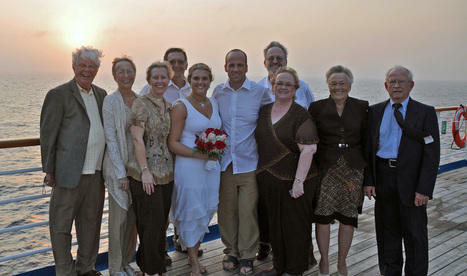 Many people are aghast that mom would interrupt her cancer treatment to go on a vacation. For many, that choice would not be the right one. Mom’s cancer, however, is terminal. She knows there is a very, very slim chance of recovery. And so, she has made the choice to really, really enjoy the life she has left. For her that involves traveling. 1. The pleasure part. Who doesn’t love a vacation? All the more so, when your cancer is life-threatening. 2. Traveling to places you’ve always wanted to see. Sort of fulfilling that Life List. Very rewarding and satisfying. 3. Traveling allows a break from the grueling treatment protocols, lifting not only the body but the spirit. 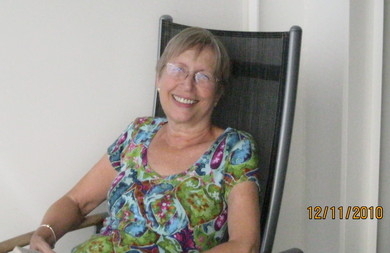 Mom has recovered strength, appetite and her humor on these trips, and come home with a renewed energy for the fight. 4. Most trips involve delicious food, comfy accommodations and the chance to leave the daily grind behind. Mom has always eaten so much better on vacation, when someone else was making the scrumptious meals. Added weight gain is a definite bonus to traveling with cancer. 5. The chance to make memories with family and friends. 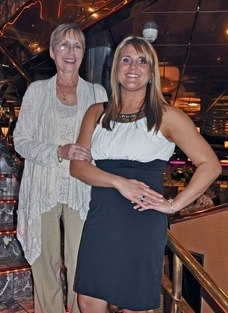 Mom’s most memorable trip on this cancer journey was the wedding cruise for our daughter, Katie. The memories made on that trip will be long cherished by all, but none more than by Katie. Having her grandmother there to smile her blessing, hug her tightly and share in the festivities is something she will always, always treasure. 6. And finally, traveling can allow us to see those we love one more time, to make right the relationships in our lives, and to say our sweet, poignant goodbyes in person. Mom had the chance to travel to Minnesota half-way through her treatment to share a beautiful weekend with her brother who has beginning stage dementia and can’t travel. The laughter, food and fun were memories on their own, but the last hugs were a closing of the family circle that mom needed desperately to make before her own life circled to a close. Traveling with cancer is not always easy, but it is feasible, and even worthwhile. So, here are some of our favorite tips to make the trip a success. First, always check with your doctor and healthcare team before planning a trip. Your particular treatment plan may put you at risk for certain types of travel. If your blood counts are down, especially your white blood cell count, you could be at risk for contracting any number of viruses and illnesses. That's not smart. Always get your doctor’s approval before heading out. Second, be sure to have enough prescription medications with you for each and every potential problem. Pain meds, nausea meds, steroids, etc. etc. When you are traveling with cancer, unexpected medical situations can pop up. Carry your medications with you whenever possible, rather than packing them in luggage. And check ahead to make sure there are medical facilities at your destination. Always prepare. This goes back to the first piece of advice, check with your doctor and plan accordingly. Thirdly, we recommend getting medical travel insurance for your trip. There are many companies out there who provide travel insurance. You can google it on the web, but be sure to determine if they cover pre-existing conditions, such as pancreatic cancer. Some do, some don’t. One neat tip we can pass on: most credit cards offer travel insurance when you pay for the entire trip on their card, and they generally cover pre-existing conditions. Of course, check with your credit card to be sure, but we have had great luck with ours, and the plus here is that you don’t have to pay extra for the travel insurance! Finally, if you are traveling with cancer and need special accommodations, say for a wheelchair or oxygen, speak up. Almost all travel venues offer help in this area. For example, we called ahead and got wheelchair service for mom at the airport. This helped immensely with her fatigue. There was no way she could have walked all the way through the terminal. We also purchased an oxygen concentrator to take with us on the cruise (they don’t allow the regular portable oxygen tanks, fire hazard, etc.) 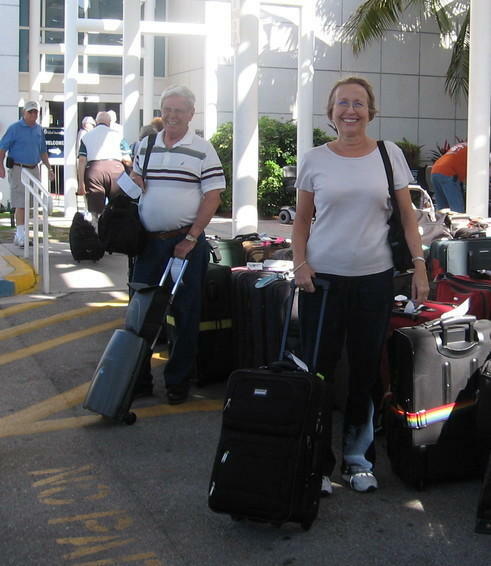 The oxygen concentrator wasn’t cheap, but has made travel possible for mom at a time when it gives her great pleasure. So very worth it. 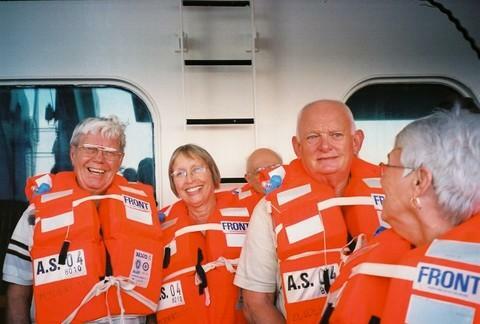 Traveling with cancer is not only doable, it can be very beneficial. When mom got back from Katie’s wedding cruise she was feeling much better and in such high spirits that her doctor noticed. He said that maybe he should prescribe a cruise for all his cancer patients. We think that would be a great idea! So if you’re thinking about traveling, but just aren’t sure, take heart. Go, Enjoy, Live Life… Don’t let this cancer tie you to the chemo lab, doctor’s office or hospital. Go, Enjoy, Live Life… And see if it’s not the best medicine!